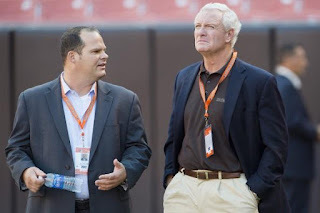 1) Tom Heckert's 2012 draft: Even with outgoing team president Mike Holmgren leaving Berea and Coach Pat Shurmur soon to follow in Holmgren's generously-carriaged wake, Heckert's fate is somewhat murky. Last April's draft, in terms of early returns at least, has been Heckert's strongest. First-round picks Trent Richardson and Brandon Weeden have had their down moments, but both have shown sparks of talent and star power not witnessed on the North Coast for many years. Supplemental pick Josh Gordon, meanwhile, has the makings of a No. 1 wide receiver, and right tackle Mitchell Schwartz has shown improvement after struggling to learn his new position. Mid-to late-round picks John Hughes, James-Michael Johnson and Billy Winn have all shown flashes of solid play as well. 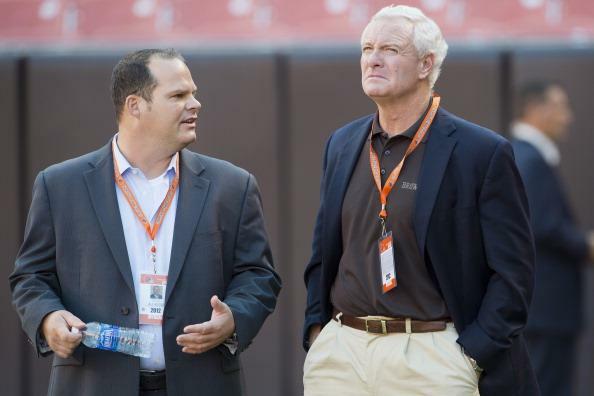 Still, it will be a strong finish by Weeden and Richardson that could ultimately be what saves Heckert's neck. If the new brass decides the franchise needs another quarterback, Heckert will not be the man to choose him. 2) Will this team "learn to win?" To the Browns' credit, most of their games this year have been competitive, if not always entertaining. But the closer the game gets, the louder the gears grind as the Browns tighten up. This is a young roster that must eventually learn to finish games - no more stalling in the red zone; no more dropped passes; no more silly penalties or special teams miscues; no more lost quarters with the team looking completely unprepared to compete. These fundamental issues have been plaguing the Browns for years. They must be ironed out and eliminated to finally extricate this franchise from the Marianas Trench of Ineptitude that has become its in-season home. 3) Short-yardage shenanigans: Many of the Browns most memorable plays this season have come on third-and-1 or fourth-and-1. These are not good, soft-lit memories as sung by Barbra Streisand, but the equivalent of a particularly painful wart extraction. The Browns' short yardage woes have become one of the biggest stories of the year, with the team converting only 8 of 18 chances on third-and-1. Part of it has been play selection - Shurmur is fond of calling passes in short yardage - and part has been the surprising ineffectiveness of Richardson. The Browns' first overall pick is just 2-of-7 on third-and-1 tries. The second half of the season should see a further jelling of the offensive line, which will get the offense a much-needed push up front and improve these woeful numbers. 4) More Jimmy Haslam reaction shots: Whether punching the air in frustration or scrubbing a hand over his face in recognition of the work that must be done to bring his billion-dollar purchase to respectability, Cleveland fans can take solace that their favorite franchise's new boss wants to win as desperately as they do.